Powerful and efficient, our 2017 Toyota Sienna Limited Premium is primed for family-friendly functionality and luxury in Silver Sky Metallic! This Sienna is motivated by a 3.5 Liter V6 offering 296hp and a responsive 8 Speed Automatic transmission. Our Front Wheel Drive minivan sets the stage for a happy family while scoring near 27mpg on the highway. Bold style and refinement are yours with its dual power sliding doors, dual sunroofs, chrome grille, a power liftgate, HID headlights, and great-looking alloy wheels. On par with a luxury sedan, the interior of our Sienna Limited Premium features premium leather, heated front seats, push-button start, three-zone automatic climate control, Driver Easy Speak, and Blu-Ray entertainment. You'll maintain a seamless connection to your digital world with Entune Premium Audio with and app suite that includes Bluetooth, Siri Eyes Free, a high res touchscreen, media interface, and integrated backup camera. Engineered with your precious cargo in mind, our award-winning Toyota Sienna helps you avoid and manage challenging driving situations with a blind-spot monitor, rear parking sensors, anti-lock disc brakes, stability/traction controls, and advanced airbags to safeguard you and your family. 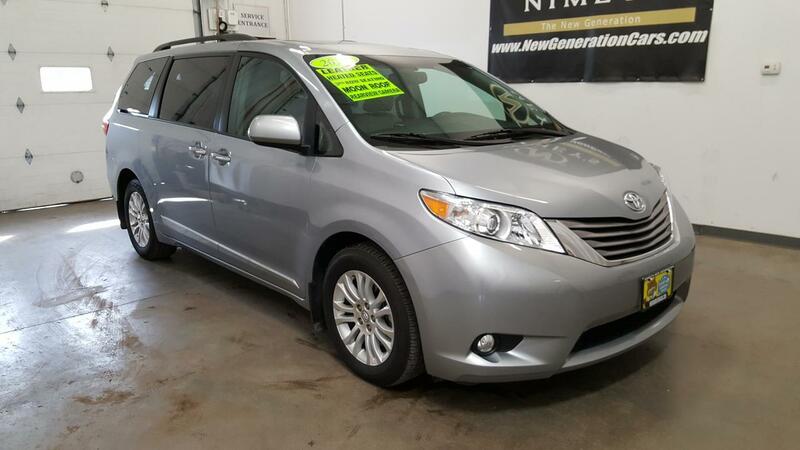 Roomy, comfortable and with a stellar reputation for reliability, our All Wheel Drive Sienna is an excellent choice for your active family. Reward them today! Print this page and call us Now... We Know You Will Enjoy Your Test Drive Towards Ownership! Transport your family in the kind of style and luxury they deserve with our 2016 Chrysler Town and Country Touring-L in Bright White Clear Coat. The soul of our refined minivan is a proven 3.6 Liter Pentastar V6 offering 283hp paired with a smooth shifting 6 Speed Automatic transmission. This Front Wheel Drive rewards you with a comfortable ride and near 25mpg on the open road. The modern exterior of our Touring-L trim is accented by great-looking wheels, a roof rack, heated power adjustable mirrors and a power-opening rear liftgate. A haven of comfort and refinement, the Touring-L cabin is complete with comfortable leather seating, reclining Stow n Go second row bucket seats, full power accessories, tri-zone climate control, entertainment system, Bluetooth hands-free calling and the Uconnect interface. Of course, Chrysler has included a multitude of advanced safety features such as rear parking sensors, rearview camera, blind-spot monitoring, and rear cross-path detection to protect you and your precious cargo as you make your way to your next great adventure. Your family's active lifestyle deserves this superb blend of style, space and comfort! Print this page and call us Now... We Know You Will Enjoy Your Test Drive Towards Ownership! Versatile and family-friendly, our 2016 Chrysler Town and Country Touring is brought to you in elegant Billet Silver Metallic Clear Coat! Fueled by a proven 3.6 Liter Pentastar V6 that produces 283hp at your command while perfectly paired with a smooth-shifting 6 Speed Automatic transmission. This Front Wheel Drive minivan is ready for anything and will reward you with nearly 25mpg on the open road! The modern exterior of our Touring is accented by alloy wheels, a roof rack, heated power-adjustable mirrors and a power-opening rear liftgate. The cabin of our Touring is much like your family room on wheels, complete with comfortable leather seating, reclining Stow 'n Go second-row bucket seats, full power accessories and tri-zone climate control. Everyone stays entertained and content with single disc DVD entertainment as well as Bluetooth hands-free calling and the Uconnect interface. Of course, Chrysler has included advanced safety features including ABS, low tire pressure warning, and plenty of airbags to protect you and your precious cargo as you make your way to your next great adventure. Your family's active lifestyle deserves this superb blend of style, space, and comfort! Print this page and call us Now... We Know You Will Enjoy Your Test Drive Towards Ownership! Our 2018 Dodge Grand Caravan SXT in White Knuckle will be a hit with the entire family! Powered by a proven 3.6 Liter V6 that offers 283hp while connected to a 6 Speed Automatic transmission for smooths shifts. This Front Wheel Drive Caravan supplies ample power when you need it while also yielding near 25mpg on the highway. Put your best face forward with our SXT that's family-friendly and stylish with its fog lights, roof rails, and alloy wheels. Upon entering our SXT, you'll be impressed with the smart design that features remote engine start, keyless entry, leather seats, a black leather-wrapped steering wheel with audio controls, and full power accessories. The entire family will enjoy the Uconnect touchscreen audio system with voice command, CD, available satellite radio, auxiliary audio jack and Bluetooth. Our adaptable 2011 GMC Savana 3500 Work Van is all business. This Rear Wheel Drive van is endowed with a powerful 6.0 Liter Flex Fuel V8 that offers 323hp and is perfectly paired to a smooth shifting 6 Speed Automatic transmission. Your reward is near 16mpg on the highway, massive cargo space and the ability to tow up to 10,000 pounds when properly equipped. Our 3500 Work Van will win you over with its can-do attitude. Air conditioning and an AM/FM audio system keeps everyone happily on their way. You'll appreciate the durability of vinyl seats, rubber flooring, and passenger-side swing out doors for your convenience. The options are endless to make this your personalized machine. Our GMC Savana 3500 comes with anti-lock brakes and stability control to safeguard you and will impress you with its versatility. Make your move on this wise investment for your business. Print this page and call us Now... We Know You Will Enjoy Your Test Drive Towards Ownership! Meet our impressive 2005 Grand Caravan SE shown in Bright Silver Metallic. Powered by a 3.3 Liter V6 with 180hp that offers plenty of passing power while mated to a smooth shifting Automatic transmission. Our Front Wheel Drive delivers up to 26mpg on the open road. You will love the spacious interior, power sliding doors, customized wheelchair ramp, and the luxury and driveability of a sedan. Our SE may well be the most user-friendly vehicle you could buy. Captains seating in the second row, multi-zone climate control, great audio system with AM/FM/CD, and a leather-wrapped multifunction steering wheel. Our Dodge Caravan SE comes with a long list of standard safety features to keep you and your precious cargo safe including ABS, dual front airbags, and more!. Print this page and call us Now... We Know You Will Enjoy Your Test Drive Towards Ownership! Meet our versatile 2008 Chevrolet Uplander Cargo Van shown in Summit White! Powered by a 3.9 Liter V6 with 240hp and 240 pound-feet of torque paired with a 4 Speed Automatic transmission. This Front Wheel Drive rewards you with 23 mpg on the open road. With four doors, a lifting tailgate, and plenty of room to haul in the back, this van is built to work for you! The Uplander Cargo interior offers comfortable cloth seats, power accessories, cruise control, AM/FM/CD audio, and so much more! This Chevrolet Uplander offers plenty of safety features including ABS, dual front airbags, low tire pressure warning, and more! Functionality, reliability, distinct styling, and versatility make this Uplander a must-see for anyone looking for a vehicle built to haul. Print this page and call us Now... We Know You Will Enjoy Your Test Drive Towards Ownership!